Unlike a game such as Blackjack, where the player has to make decisions, Baccarat is always a game where you act as an observer, but with Exchange Baccarat you can now change your mind as the game unfolds - either consolidating your position or minimising your exposure. In terms of strategy, your best bet is still to use the 1-3-2-4 betting system on Dealer. In this case, though, you have the opportunity to change bets after each round makes the situation clearer. Other than following our usual Baccarat strategy ie betting on Dealer, there's no real decision making to be done yet. The cards are dealt and the odds on each bet change instantly! Don't forget that the odds on the side bets will also now start to change. Play now continues for up to 4 more rounds, depending on the cards dealt. This follows standard Baccarat rules in terms of whether the Dealer and Player receive more cards or not. This is the great part of Exchange betting - betting in-play as the game changes and other punters react - always remembering that you can Lay (bet against) a certain result as well as Backing (betting for) it, giving you the chance to play safe and go for the obvious or bet big on an outside bet, hoping to win big! 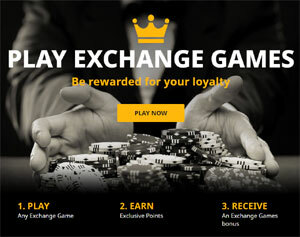 If the above has whetted your appetite, and you'd like to give Exchange Baccarat (or any of the other Exchange Games) a spin, just click on the link below and we'll take you straight there!